Fun with random data. Find, investigate, and plot. I parse an NFL dataset, and visualize it in a GoogleCharts Column Chart. – If the year hash count variable already contains a key with the next row’s year, then get its value, increment it by 1, and update the pair. Do the same thing for the weight averages hash, only with weight. 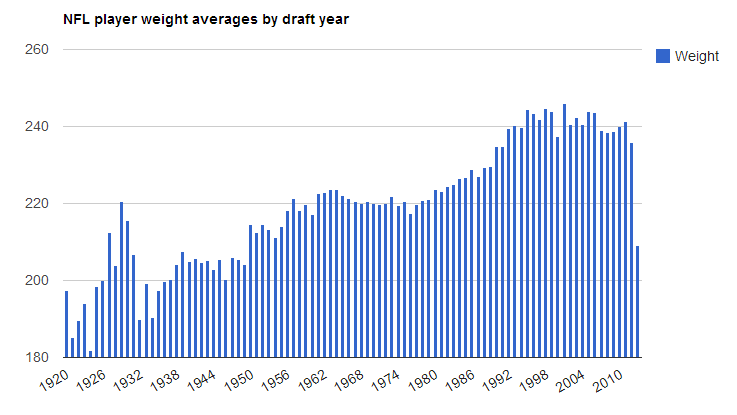 Accumulate weight totals for each year. iterate through year count hash. Create new has with year and weight averages hash. Perform calculations on each pair in year hash count. Cast pairs into float types, divide weight accumulated totals, by counts. output the contents of new hash. Obtain a Column Chart from GoogleCharts and save it locally as an html. Adjust example properties with note pad. This entry was posted in DataViz, Ruby on 04/03/2014 by MantasCode.